(above) Vivienne Westwood Couture "Long Cocotte" dress (price upon request) from Vivienne Westwood. Jennifer Behr triple-strand crystal headwrap in crystal antique gold ($325) from Jin Wang. Elahn Jewels quartz cocktail ring ($3,800) from Elahn Jewels. Martin Katz Asscher-cut diamond ring ($68,500) and 18K gold earrings ($185,000) from Martin Katz. 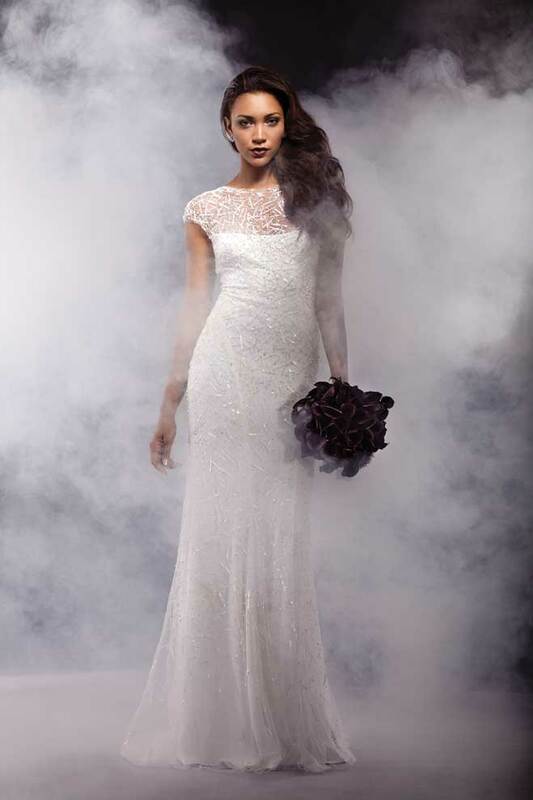 (above) Amy Michaelson "Flash" gown ($3,595) from Mon Amie Bridal Salon. Jennifer Behr "Galaxy" headband ($625) from Susan of Burlingame. Amrapali diamond and ruby snake bangle ($5,632), diamond cuff ($3,949) and diamond and emerald drop earrings ($23,661) from Amrapali. Elahn Jewels triple sapphire ring ($4,500) from Elahn Jewels. Martin Katz Asscher-cut diamond ring ($68,500) from Martin Katz. (above) Mark Zunino ivory silk crepe gown ($7,500) from Mark Zunino. White fox fur stole ($3,500) from Edwards-Lowell. Le Vian's Carlo Viani 14K honey gold necklace ($56,497) and strawberry gold snake earrings ($3,476) from Macy's. 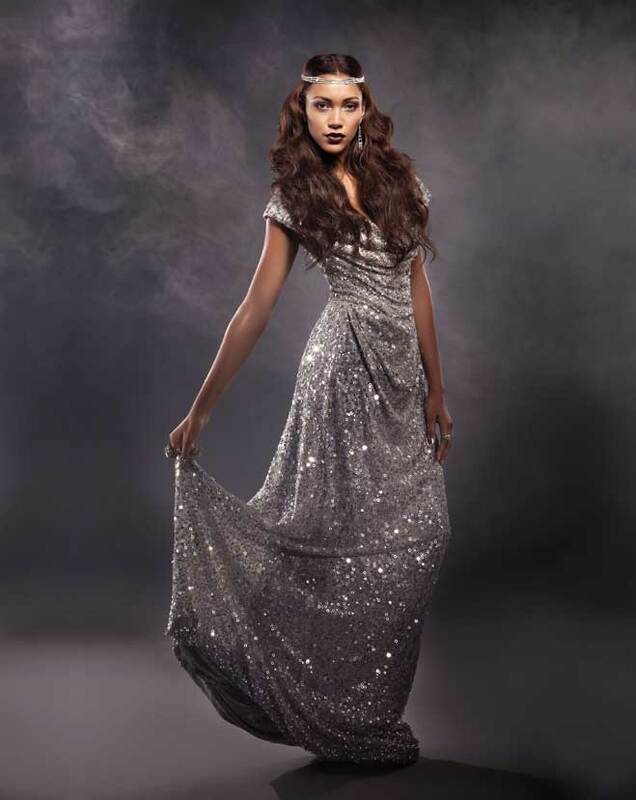 (above) St. Pucchi Couture glistening fit and flare gown ($6,590) from St. Pucchi Flagship Salon. Amrapali rose-cut diamond necklace ($20,801) from Amrapali. Monique Lhuillier crystal headpiece ($690) from Monique Lhuillier Flagship Salon. L'Dezen Jewellery 18K gold diamond earrings ($10,100) from Chic Little Devil. (above) St. Pucchi Couture fit and flare gown ($6,590) from St. Pucchi Flagship Salon. Littledoe is Love vintage headpiece ($525) from Principessa. Sethi Couture 18K rose-cut marquise earrings ($11,600) from William Harold Jewelers and Roseark. Sethi Couture 18K white gold ring ($21,190) from Damiani. (above) Reve by Khushali Kumar backless blush gown (price upon request) from Reve Luxury. Le Vian chocolate and vanilla diamond ring set ($6,247) from Macy's. Ocnarf Sairutsa Nualah diamond and emerald earrings ($9,000) from Church Boutique. (above) Ines Di Santo "Malibu" gown ($5,500) from Lovella Bridal. Karine Sultan hammered hematite cuffs ($135) and Irit Design diamond and emerald earrings (price upon request) from Barbara Pizik. (above) Monique Lhuillier Celestial sheath gown ($8,700) from Monique Lhuillier. Norman Silverman diamond cluster cuff 18K white gold earrings ($123,800) from Traditional Jewelers. Hot chocolate mini Calla Lilies (price upon request) from Sticks and Stones. (above) Ines Di Santo "Confetti" strapless mini gown (price upon request) from Lovella Bridal. Jimmy Choo "Mimic" heels ($895) from Jimmy Choo. Martin Katz Assher-cut engagement ring ($68,500) and 18K gold diamond and emerald earrings ($95,000) from Martin Katz.